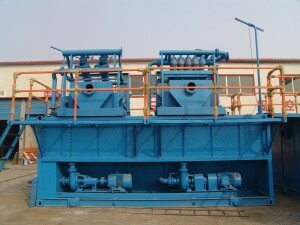 The drilling mud cleaning system are required in oil well drilling,horizontal drilling,the mud cleaning system fuction is for preparing clean mud for drilling rig. In oil well drilling, drilling mud must be supplied to the hole as the well depth progresses. One of the basic functions of drilling mud is to carry the drill cuttings up to the surface so they can be disposed of. A drilling mud in common use today is typically composed of barite and water. There may be other constituents, (such as oil) but they would exist only in small amounts or percentages. Since large quantities of drilling mud are needed in drilling an oil well, it is desirable to recover the barite, and recycle it. Various drilling mud cleaning systems are in use today for separating the drill cuttings from the slurry so that the fluid and/or barite can be recycled. Most systems use a combination of one or more screens or sieves in a series flow relationship, with a final separating step using a hydrocyclone or centrifuge. Hydrocyclones desander and decanting centrifuges are expensive pieces of equipment with high energy and maintenance costs. In HDD drilling mud cleaning system,sometimes there is a single tank, closed-loop system or a multi-tank mud system is required, GN Solids Control can develop the proper system to meet specific requirements. from small HDD (hirontal directional drilling mud system) to deep oil well drilling mud system. Yes! thought your post is a very interesting + informative ! International Electric Rigs specializes in custom design, building Mud Tank Systems for various volumes and flow rates. Other Harsh environment designs are available. We are interested in the mud cleaning system,pls send more info.